UPDATE: I’ve replaced My Hilux with a 1990 80 Series Turbo Diesel Land Cruiser. I’ve owned my Hilux for several years now, and love it. It is a 1997 Toyota Hilux Tamworth 2.4 litre petrol with leaf springs all round. I’ve have done a few modifications to make it more capable and enjoyable. When I purchased it, the car came with a rear bar, aluminium bull bar, side steps, stereo, a good service history and just over 231,000 kilometres. This sounds like quite a lot, but these cars are known to do well into the 400,000 kilometres if they are treated well and serviced regularly. I spent a lot of time planning what I wanted my car to do and as a result ended up with something which meets almost every single need that I have for it. The Tamworth Hilux is a special edition and it has a few stronger parts and cup holders. As you can see the list of modifications is not overly long, and the best part about it is that they were very cheap to do. In the car’s current condition it can do almost anything that I throw at it, which means that I have a capable, economical and fun car without spending a huge amount of money. In total I have spent under $13000. I haven’t touched the suspension (although the front leaf springs are almost flat!) which means the ride isn’t great, but it’s a compromise that I am more than willing to live with at the moment. There were a number of reasons that made me choose my Toyota Hilux. I was looking for a four wheel drive that was reliable, good looking, capable and strong, economical and preferably a Ute. This really limited my options to a Hilux, so I began the search for the right one. There was only one model that I was really looking for as well, which made it quite difficult to find. I wanted a petrol Hilux without independent front suspension, that had been well looked after with little off-road work. My budget was set at in between $8,000 and $15,000 depending on the modifications that had already been installed. The reason I was after a petrol Hilux is because the 2.8 litre diesels are extremely slow without turbo’s, and I wanted to convert the car to gas. I was also after the model Hilux with leaf springs all round, because they tend to be stronger and better off-road. 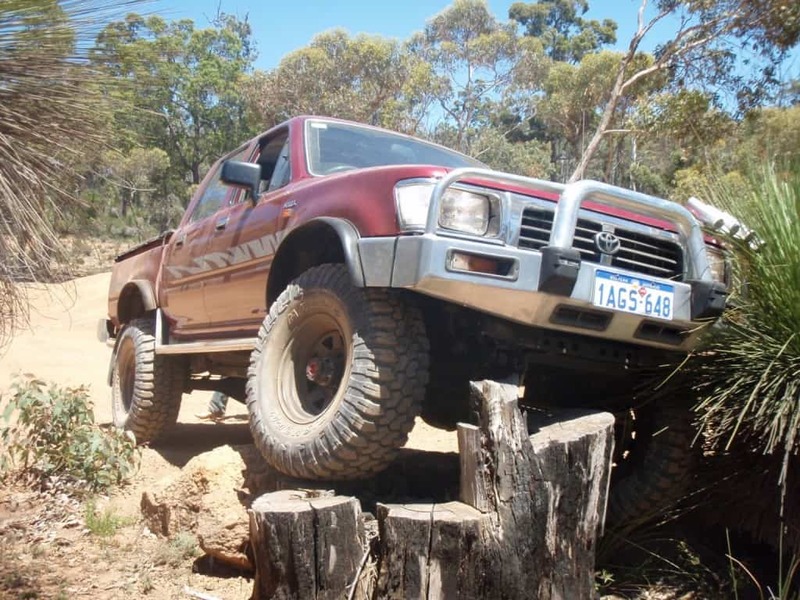 Strength is a major issue when doing serious four wheel driving, especially with bigger tyres, which is why I was trying to buy a solid axle Hilux front and rear. 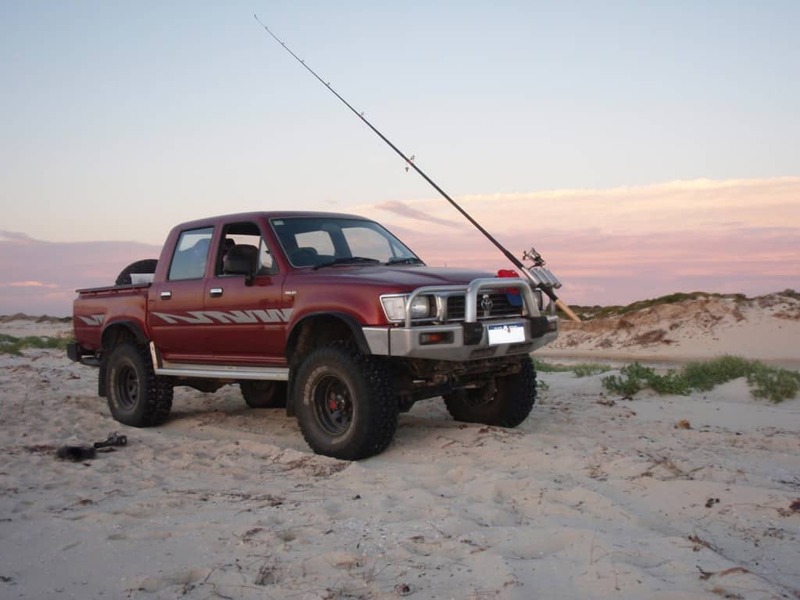 I wanted a Ute being someone who often needs to carry things to and from work, as well as it makes it easy to go snorkelling and fishing off the beach! Even if you spill something you can hose it out, unlike the back of a normal car! A body lift involves lifting the body away from the chassis. This is basically the cheapest way to lift your car. The reason I needed the extra height was to allow for some larger tyres to fit in comfortably. Hilux’s have a name for rolling easily (Rollux) so be careful how you go about it. You can fit the body lift yourself, if you feel like it or you can pay for someone else to do it. I took the easy way out and got Wilkinson’s Suspension to take care of it. I paid just over $500 dollars for the blocks, bolts and labour. Alternatively, you can buy the kits for around $200 from Snake Racing and fit them yourself. There are 12 bolts that need to be replaced with longer ones once the body blocks are fitted. The blocks are usually made of a very hard plastic, or you can get aluminium ones made up. The aluminium ones tend to be more expensive, and the plastic ones do the job just fine. Make sure you get the right grade bolts as well, otherwise they will just snap. My body lift was quite simple, because other than changing a radiator hose and taking a little notch out of the steering shaft, nothing else had to be changed. 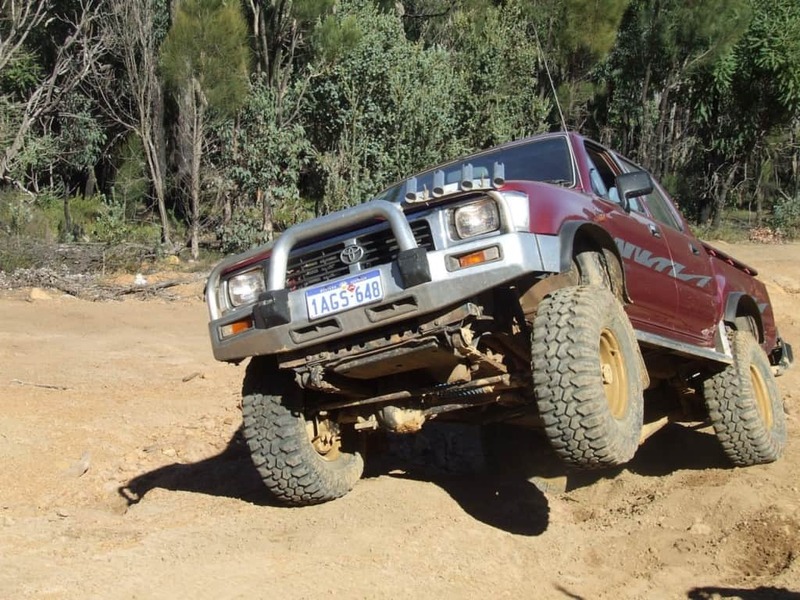 In Western Australia, a 2 inch body lift is the maximum body lift you can do. Some body lifts can become complicated, because you may have to move the radiator up, extend brake lines, modify the low range gear leaver as well as change other bits and pieces. For example, Range Rovers have the seatbelts attached to the chassis, so you have to change that as well! Once the body lift was in, I proceeded to get the car converted to gas. At this stage in time, the conversion was almost free because of the government rebates. I believe now it is only a $1000 dollar rebate (rather than $3000). Being a carburettor model Hilux, the gas conversion couldn’t be fuel injected, but it also meant it was only about $3200 to do. I had a 60 litre tank fitted, which does around 300 kilometres for about $35 dollars. Basically this means I have a big four wheel drive which costs less to run than the average commodore or falcon. If you want a good gas conversion done in Perth, be sure to take a look at Quickshift Auto’s in Myaree. I also use Quickshift for my services, because they do a great job at a reasonable price. The tank sits extremely high up, which is very important if you plan on doing some serious 4WDing. The last thing you want is to dent or knock your tank off. The problem with fitting a gas tank was that the place to fit your spare wheel was no longer available. Of course, with 33 inch tyres it probably wouldn’t have fitted anyway, but it gave me the chance to make up a tyre carrier. The Hilux already had a Kaymar rear bar fitted with the stub axle, so all I needed to do was source the bits, cut it up and weld it together. This can actually be a pain if you don’t know where to look. There is a company in O’Connor called Martins Trailer Parts which provides parts throughout Australia for the stub axles. With the help of a mate and a Saturday to spare, we set about making the tyre carrier. You can also purchase the swinging locks so that it stays shut when you want it to from various hardware stores, but make sure you get a heavy duty one. After cleaning it up, we gave it a coat of black paint and threw it on. Something I should mention is to either copy a good design or make sure that it’s braced very well. Only a few weeks after building the carrier (and some very bumpy 4×4) I had a look and found a crack that was starting to develop. We pulled it off and braced the carrier in several ways, and it is now rock solid. The last thing you want is a big tyre landing on the road when you are flying down the freeway! These are known commonly as Sunraisers, and are basic steel rims. I chose to go with black rims because they look much better than white, and they don’t cost any more. Something to be aware of is the offset of your rim. This basically refers to where the centre plate of the rim is located. Negatively offset rims stick out from the side of the car further, and positively rims sit closer together. To make it simpler, the more negatively offset your rims are, the bigger the distance between the two tyres. As mentioned above, Hilux’s tend to be prone to lying down, so I got rims which were heavily negatively offset. Combined with wider tyres, the car is now much more stable. I spent a lot of time trying to work out what tyre I wanted. I wanted something that was cheap but that would last and still do a great job off-road. I also wanted a mud terrain because they look mean and go very well on rocks and mud. I looked at the Cooper mud terrains, BFG muddies, Good year and various other brands. The cooper tyres have a good reputation in America, and are quite strong but frankly were way too expensive for what I wanted. Sure, if you are travelling across Australia then it might be worth the extra dough, but not for me. After some thought I decided to buy a set of Maxxis Bighorns (33×12.5 inches). These rubbed a little on the sidesteps and mud flaps, so I had to cut the sidesteps and remove the mud flaps at the front. They tend not to be so great on sand (because they like to dig holes) but if you deflate the tyres a fair bit beach work becomes very easy. I have now done about 15,000 kilometres on these Maxxis Bighorns, and they have performed flawlessly. Compared to other muddies, they are incredibly quiet on road. The wear has been almost nonexistent (but make sure proper rotation occurs). Considering they got rated second best in the latest 4×4 tyre testing, they can’t be too bad! I will definitely get another set, because they work brilliantly in mud and on rocks, and very well on the beach as well. They even rated higher than the Cooper muddies, which are about a hundred dollars more for each tyre! 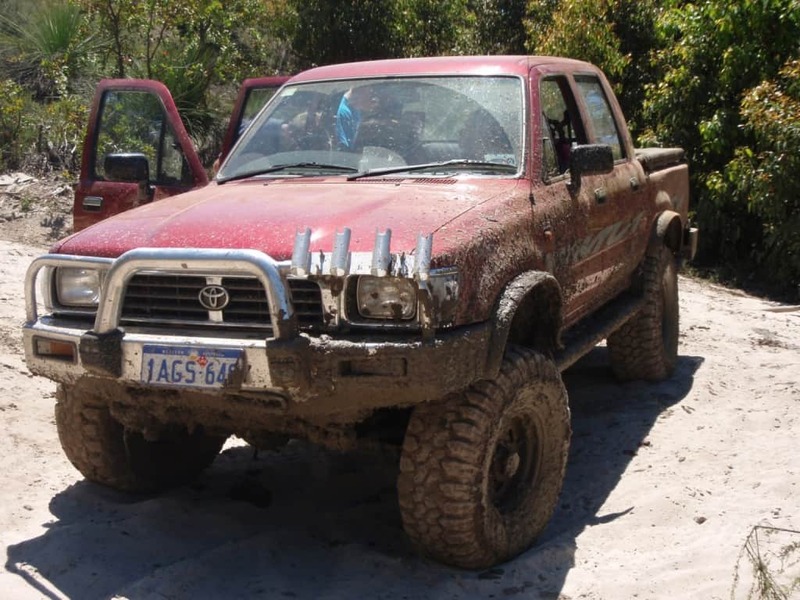 The Hilux does almost everything that I want it to, but there are a few areas that could be a bit better. The engine is only a 2.4 litre carbie, meaning that power is not huge. If you run it on petrol then its sure not slow, but having some extra power would be nice in the sand. I haven’t re geared it since putting new tyres on, which means beach work is usually always low range. Many people convert these engines to standard commodore v6’s, commodore v8’s and even other Toyota v8s. As a dual cab Ute the room in the back is pretty poor, but it’s significantly better than a 5 seater 2 door Ute. The only other thing I could complain about is the suspension, but the only reason it’s not the best is because it is old and really needs replacing. If I spent the money and got a set that was soft and flexible the ride would be much better. • Small differential pumpkins mean brilliant clearance. Compared to Land cruisers and Patrols who have to run 35’s to get good clearance, I have great clearance with tyres 2 inches smaller. • Having a tray at the back. This makes it easy to throw fishing gear and diving gear in the car. On the beach you can throw a wetsuit on whilst standing in the tray, and you avoid the sand. • It’s decent on fuel; slightly more expensive to run than the average falcon or commodore. I get 14L/100km on Petrol and 18.5L/100km on gas. • It looks great and handles well off-road. • Roomy in the front seats; I am 6”6 and need the room. I have a few mates with other car’s that simply are not big enough for me to drive comfortably. • Vinyl floors and seats make it extremely easy to clean. Vacuuming is easy and what is left you just sponge out. I have been to a number of places around Perth, but my favourite still include the Mundaring Powerlines Track, Dwellingup, Dunsborough, Honeymoon Pool, Lancelin and Wedge Island, the Holland Track, beaches in Mandurah and the coast between Lancelin and Jurien Bay. I will go into more detail of some day trips from Perth as well as camping and other holiday trips in future posts. Nice truck. I have owned Toyotas for over twenty years and love them. Thanks for stopping by my blog. Not a problem, its well set up. What sort of Toyota’s have you had? Just interested in the bighorns, how are they wearing, how many ks now, I was looking at running them on my 200series cruiser. Pretty funny; I am just in the middle of writing a post about the Maxxis Bighorns! I would highly recommend them, but it depends on what you want to do. 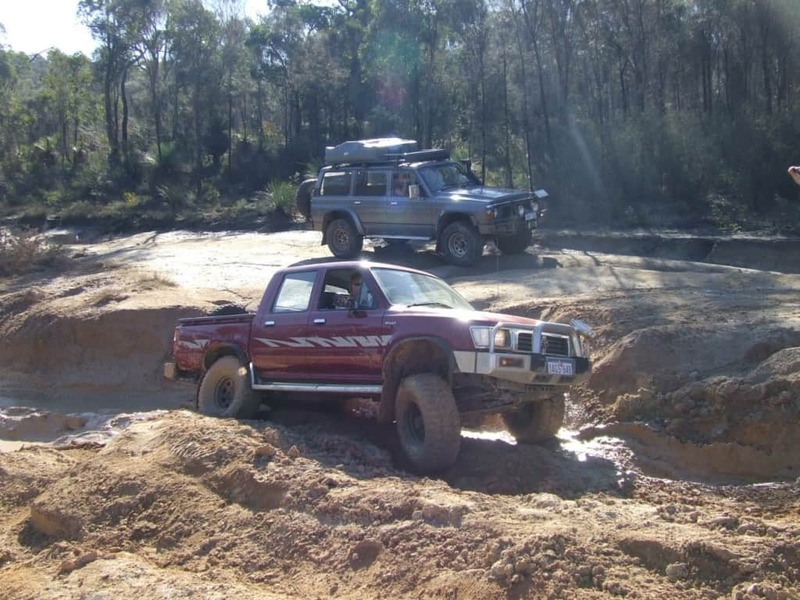 I run them on my hilux, and I have two mates who run them on a 60 series land cruiser and a GQ Patrol, and there are a heap of other people using them as well. On all 3 cars they are wearing well, and perform flawlessly through mud and on rocks. They are not brilliant on sand, but then what do you expect from a muddy anyway. If you are planning on doing some seriously remote touring and you have the money, then maybe a more expensive set of rubber would be worth it, but for everyday road use and playing around they are brilliant. They are one of the quietest mud terrain tyres I have come across. From memory the cheapest place to get them at the moment is Bob Jane T Mart, but it pays to shop around. My set look to do around the 70 – 90 thousand kilometre mark, which is normal (to my knowledge) for this tyre. Considering how cheap they are, you really can’t top that. You say that the Bighorns are cheaper than the others, BFG’s and Coopers. How much did you get them for if you don’t mind me asking? I purchased 5 rims and 5 bighorns from Ian Diffen. I paid 70 dollars a rim for black ROH rims (you can get them for $50 from ROH) and then each Maxxis was $330. I know you can get them cheaper from Bob Jane, but you need to really shop around. Considering the Coopers are over a hundred dollars more each tyre, its a bargain to get the Maxxis. Mine are still going great. mate you got the best of the Lux’s there mate I reckon.. I am unquestionably bookmarking this page and sharing it with my acquaintances. You will be getting plenty of visitors to your website from me! I Really like this post! Keep up the good work! Sweet website mate i like! 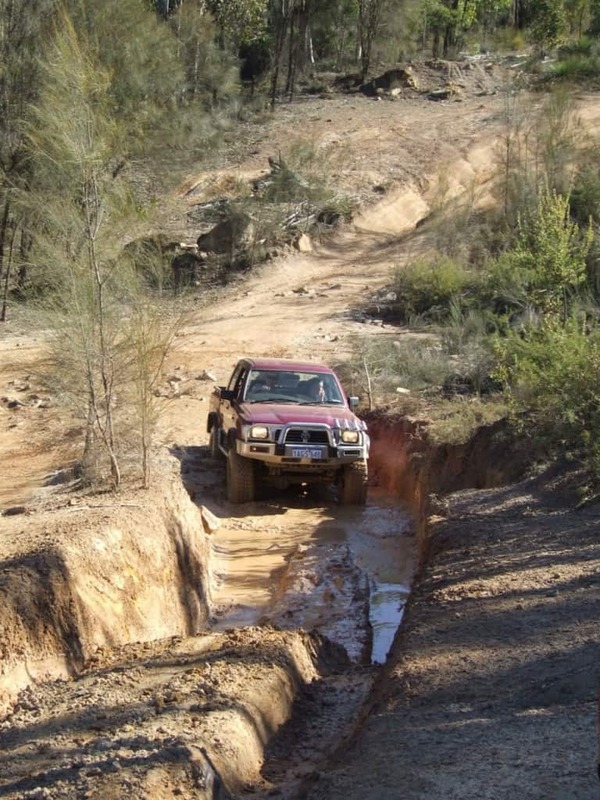 WoW….very helpful confirmed alot of what I wanted to do with “Gertrude” 2004 Hilux 2.7 EFI…………putting in a 4″ skyjacker suspension kit though and yes CNG conversion (i was thinking to put the tank where the spare wheel is so it was nice knowing some one did it and its working great!!!!!!!!! you made up my mind on the size tyres I should use so I’m definitely going with 33x 12.5 x 15 Bighorns on 10″ rims ……Thanks alot for your posts and keep up the good work n offroading dude!!!!!!!!!!!! Thanks for the visit and comment Kurt. I am considering putting the 2.7 EFI in my hilux soon. If I did my gas conversion again, I would try to get a bigger tank without limiting my clearance. As it is 55L doesn’t go far enough. If you can, try to get a H shaped tank (2 cylinders joined together in the middle) as this will give you a lot more capacity for gas. You might pay a bit more for one, but not having to fill up so often is a huge benefit. Also, I think you mean 15″ rims, not 10″. Hey great to see other hilux lovers out there! Sounds like you got a good deal. I guess what you need to consider is what you want the vehicle for. 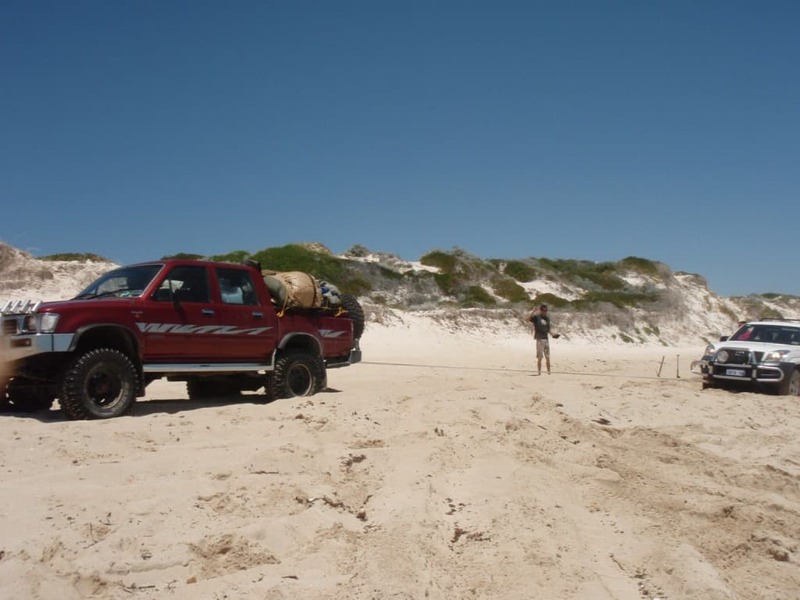 A hilux with 33″ tyres will have the same clearance as a Patrol or Landcruiser with 35″ tyres. You really don’t need to go any bigger than that. 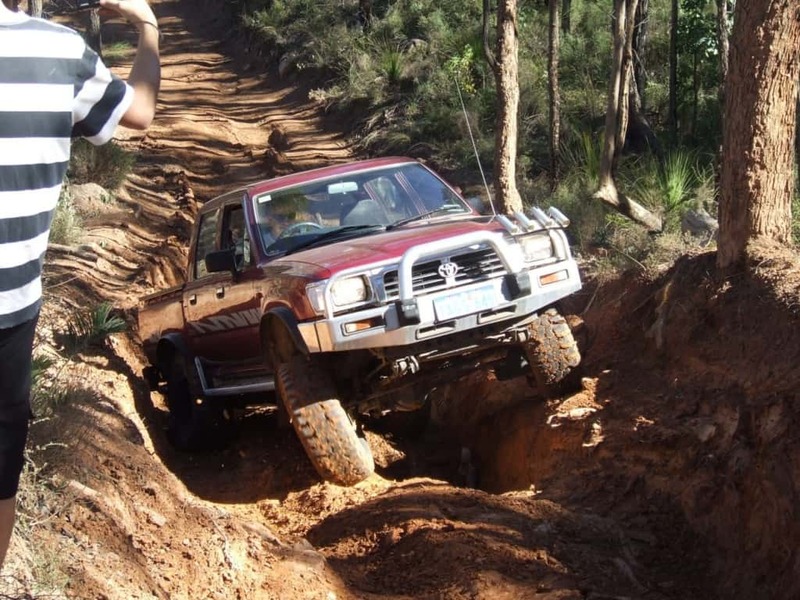 Hilux’s are not the most stable vehicles; I would keep it as low to the ground as you can. 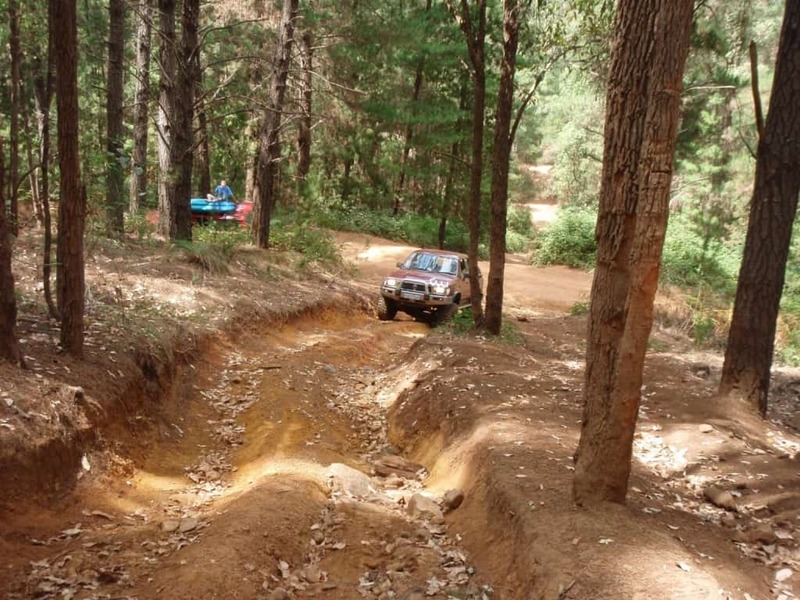 You can fit 35″ tyres with a 2 inch body lift by moving the front diff forward about 35mm – not that hard to do. Honestly, I’d go with a body lift because they are cheaper, but it depends on your bullbar and rear bar. As for the competition trays, they look good but are not always that functional. I’d leave the sagged suspension; mine is sagged too and still performs well. My suggestion is to drive the vehicle as is, get used to it and then make modifications based on what you are not happy with. A turbo would be a great addition to that engine as you will get better economy and a lot more power. Good luck with the great car – they really are incredible off-road. hey just wondering if you no what the latest sr5 model made was that can have bigger tyres put on with out modifying the wheel arches? I can’t really answer that. They vary considerably, as do the sizes of tyres (how much bigger do you want to go?). 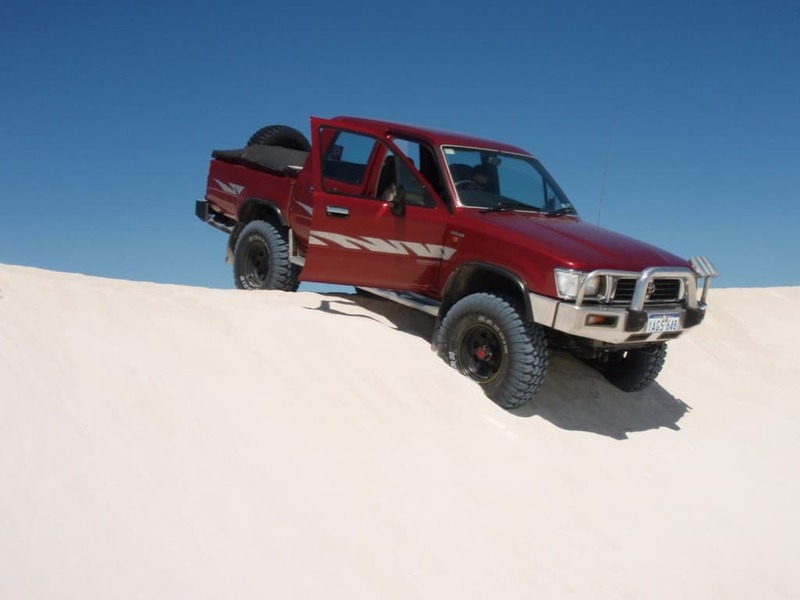 SR5 hilux’s started back in the 1980’s – their wheel arches have changed a lot. Any particular reason why you want an SR5? What sort of budget do have in mind? Nice hilux you got there. I have a 02 2.7lt EFI SR5 dual cab. I have had it for about 6 months and is my first 4×4. Its a strong and very reliable ute. Great for going out the river and playing in the mud, the kids love it too and not too “truck like” to drive down to the city. My mates all have Diesels and almost put me off buying the 2.7lt but i went along with it as i am wanting to convert it to Gas. Their Diesel 4×4 are getting the same kms as mine anyway, and Diesel is now more expensive at the pump. Looking into it now, the rebate has dropped to $1500 but as im planning on keeping the car for a while, i thinks its worth while. ATM it costs $80 to fill it with fuel and i get around 420kms out of it. So good to see someone out there likes their EFI model just as much as me. It’s great to hear you like the truck – at the end of the day that’s all that matters! My Hilux isn’t EFI – its still Carburettor. You would have more power and economy than me, but I have a solid axle on the front end and your’s is independent suspension. They are both great vehicles. If you do get it converted to LPG, make sure you tuck the tank away as far as you can, and you would have to move the spare tyre (by getting a rear bar and tyre carrier probably). I can’t say I have ever taken mine off – the car was fitted with an upgraded stereo when I bought it. Like you – I hate pulling something for fear that it will break! I’ve always found that taking it to someone who can do it properly is the way to go. Every time I have tried to get trims off something breaks! Very nice Lux you have there. Do you know what bullbar (Make and Model) is on your lux? Where did you get the wheel hub Flares from?? Thanks for the comment. I have recently removed the bull bar – but I believe it was a factory Toyota aluminum one. I have recently fitted an ARB Winch bar, which is considerably stronger. Believe it or not, you actually pay more for an aluminum bar than you do for a steel one! The flares were purchased from Ultimate 4wd in Canningvale (they are bushranger brand) and you can get 30 or 60mm ones. I believe they were about $70 for a pair. A lot of people go to Bunnings and buy garden edging (much cheaper and just cut it to shape. Alternatively, you can go to Clark Rubber and buy 3 – 5mm thick rubber and use that, as it is a bit more flexible. Thanks for that. will look down Bunnings then haha. yeah the ARB winch bars look great!!! At the moment have the same aluminium bullbar as you did but i just dented the side of the flare (side bit) and cant find the bullbar anywhere to purchase the part. You dented the side of the bullbar? Isn’t it all one piece? Most bull bars are all one piece. How badly bent is it – you might find you can just bent it out with a bit of brute force. Its too badly bent. if you look at your first picture of your lux you can see the bullbar then just in front of the wheel is a piece of aluminium joined by the back line which you can see. Thats what i need. The bull bar is all one piece – are you going to get the bent bit chopped off and a new bit welded in? I would have thought the only way to fix it is to get a new bull bar. 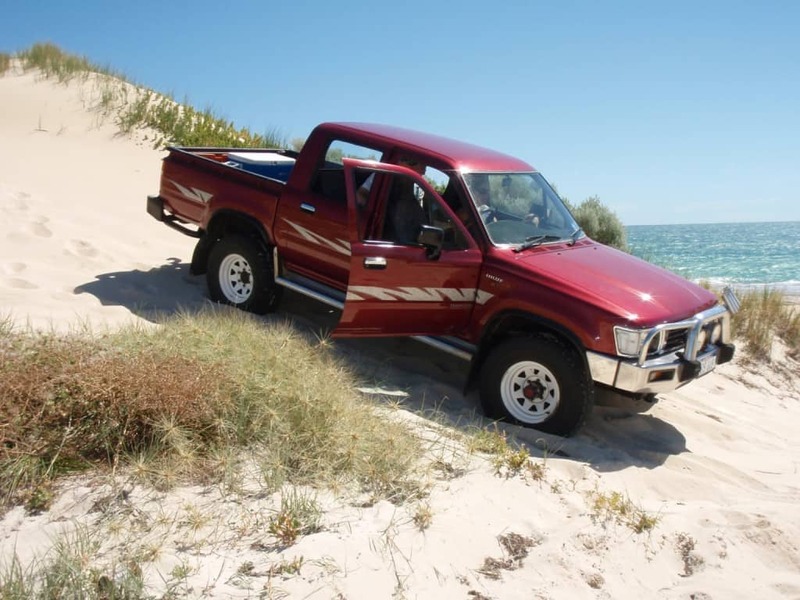 I have purchased the exact same Tamworth hilux , its done 260k and is great condition. Do you know how many 1997 Tamworth 2.4l Petrol 4×4 where manufactured ? That’s awesome mate – what colour is yours? I don’t know how many were made, but I can’t imagine there would have been too many. I have yet to see one in Perth anyway – only the 2.8’s with the same decals. same colour as yours. did they make them in other colours ? Would be good to know how many where made. seeing as they are limited editions. Yeah its the same colour. I would say they were just made for Australia seeing as the Tamworth Edition i am told was made for the Tamworth Country Music Festival celebrating 100 years or something. Mate. There is this scraping noise coming from the gearbox when I’m in 1st 2nd 3rd and 5th ….. I have just driven up to Perth and this scraping noise had gotten worse? Any ideas? The Previous owner said the next gear box oil Change is 10k km away. What model Hilux is it? I’d get the oil changed ASAP, and look for any metal fragments in it. I doubt this will fix it, and would recommend getting it checked out by a mechanic. Generally noises like that become very costly if you leave them! Sorry I can’t be of much more help! Nice to see you look after my old truck, I figured you would ! I am glad to hear it has been trouble free as it had never broken down previously and I was very carefull off road with it. My wife stumbled onto this site, and I quickly recognised the hilux. The bt50 I replaced it with has had a similar list of mods to yours, done to that too. So far it has been trouble free aswell and has done a few ks off roadup north, Pilbara, gold fields, down south etc. If I spot you on a track somewhere I will say gday ! I had a lot of fun with the Hilux, and it was incredibly reliable. I’ve only just sold it, and am looking to upgrade to a newer coil sprung wagon. I’ve been trying to get some more of the ‘Baagoo’ product you were using; any idea who sells it these days? I have only just replaced the tyres on the Mazda after 120k and they had done 0ver 20k offroad. They still had about 10k left on them. They were Michelin ltx all terrains. I would recomend them for all conditions except mud. They last longer than Coopers and are as quite as car tyres, the only down side is $375 each. Could you give me some advice on fitting a front mount Intercooler on my hilux 2.5 kd engine and will it need a blow off valve. in it, never let me down, i have broke 2 lots of rear springs but it did’nt affect the handling at all whilst still using it broke. the original batteries were over 12 years old when i needed to replace them. best truck i have encountered . They are an awesome vehicle. I was very happy with mine. Where are you located? I didn’t think there were any 1997 2.4 diesels! Great read, love your old lux! Cheers mate. I miss it from time to time too, but I’m not complaining for a second about the 80 series!